Victoria Jimenez is the owner of La Casita de Niños. Victoria is currently a breastfeeding mother herself and wants to help enable other mothers to meet their breastfeeding goals. She proudly informs mothers who tour her site that she supports breastfeeding and there is an area for them to feed their babies. Victoria was excited to join Breastfeeding-Friendly San Diego (BFSD) to learn more about how to properly store, handle, and feed breast milk. 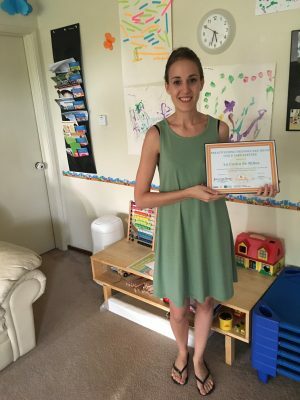 Victoria is proud and excited to advertise her family child- care home as breastfeeding-friendly! Congratulations to Victoria and La Casita de Niños for becoming a Breastfeeding-Friendly San Diego partner!